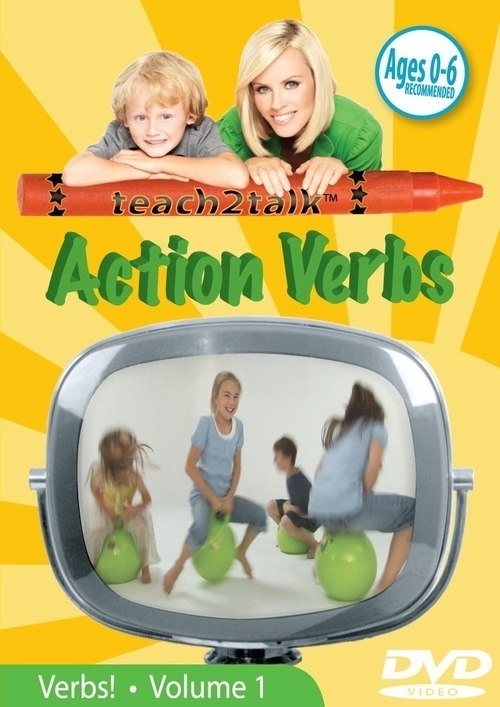 Action Verbs, the first volume in teach2talk’s™ Verbs! series, helps teach children over 40 action verbs by using humor and song and by introducing each verb in a variety of contexts to help your child understand and start using these action words. teach2talk’s™ Verbs! 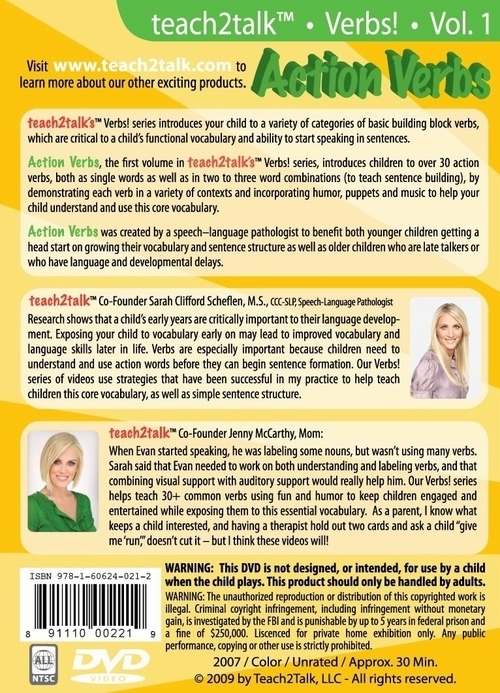 series of DVD videos focuses on building your child’s functional vocabulary by helping to teach your child categories of basic building block verbs, which are critical to a child’s ability to start speaking in sentences. These videos are designed to benefit a wide variety of children at different levels of language proficiency and vocabularies, from very young children aged less than two years who are want to get a head start on growing their vocabularies, to children aged two to three years who got a late start talking or simply need some help building their functional vocabularies, to older children with significant language and developmental delays. When Evan first started speaking, he used a variety of nouns, but wasn’t using many verbs. Combining visual support with auditory support really helped him learn and understand verbs, and that’s what these Verbs! videos do! As a parent, I know what keeps a child interested, and having a therapist hold out two cards and ask a child “give me ‘run’,” doesn’t cut it – but I think these videos will! Research shows that a child’s early years are critically important to their language development. Verbs are especially important because children need to understand and use action words before they can begin sentence formation. teach2talk’s™ Verbs! series of videos use strategies that have been successful for me in my practice in teaching children core vocabulary skills.